This guy has a really, really awesome wife. 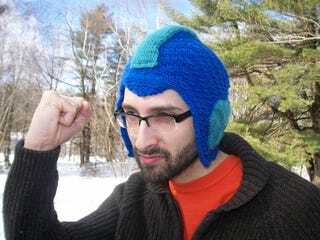 Not only did she knit him a cozy toboggan for the winter, she even accommodated his request to make it into a Mega Man helmet cap. It took two years of begging for her to finally relent. The post is from last year, and it's not for sale, but I'm sure this lucky dude (who looks like Gordon Freeman) is both enjoying his Mega Man 9 and looking forward to breaking this out once the chill hits. Mega Man Paul [Trinknitty's Blog, via Go Nintendo] BTW: Before any of you English majors attempt to correct me on the usage of toboggan: "3 - chiefly Southern & Midland: STOCKING CAP"